When a new Ascend version is available, each user receives a daily update prompt immediately on login. An alert also displays in the Messages pane of the Ascend Desktop. Your store's server must be updated prior to updating any workstations. Update all computers during non-business hours. Every computer must be updated separately (workstations can be updated simultaneously). 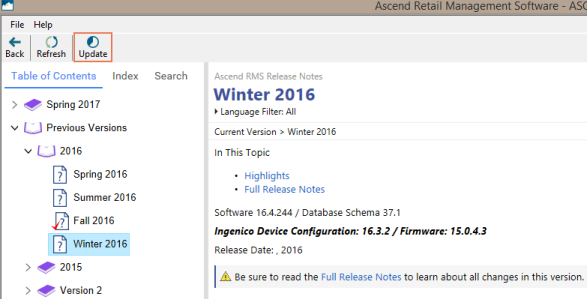 (multi-store retailers) Some Ascend functions may not function properly until all locations are updated. Each store must be updated separately. Sherpa Tip: Review the release notes and Ascend University modules prior to updating to ensure your shop is prepared for all the changes in the new version. From the Update prompt, click Take me to the future. Or, from the Ascend Desktop, click the Internet Update tile. Release notes for the current and past year's versions can be viewed from the Internet Update screen. From the toolbar, click the Update button. On the Install new application update prompt, click Yes. 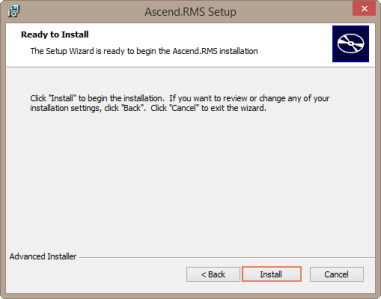 Download progress displays, and the Ascend.RMS Setup Wizard automatically runs. Sherpa Tip: If your location has a slower Internet connection, the download process can take several minutes. 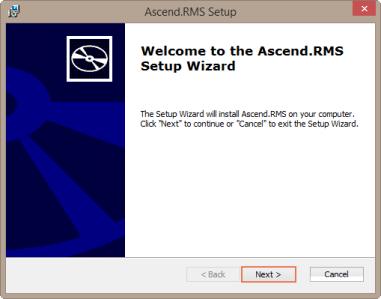 Welcome to the Ascend.RMS Setup Wizard: Click Next. 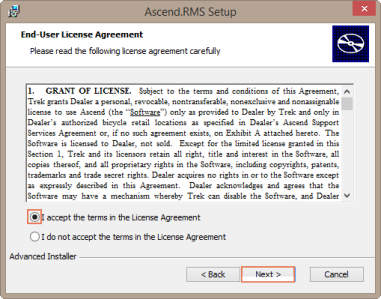 End User License Agreement: Select I accept the terms in the License Agreement and click Next. Ready to Install: Click Install. Sherpa Tip: This process can take several minutes. Completing the Ascend.RMS Setup Wizard: Ensure Launch Ascend.RMS is checked and click Finish. Log into Ascend. A backup automatically runs, and the system database updates. Sherpa Tip: This process can take several minutes. Log into Ascend. If the workstation has a payment terminal connected, a Firmware Update prompt displays. On the Firmware Update prompt, click Yes. The payment terminal automatically calibrates and installs the new firmware version. Sherpa Tip: This process may take up to 15 minutes to complete on each device. Do not unplug your payment terminal until the Firmware Update Complete prompt displays.